Amazing shot I captured right at dusk. 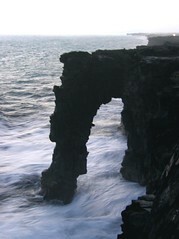 Along the coastline, of volcanoes national park in hawaii. Canon Powershot S400 did amazingly well at capturing this in a very low light situation.